THIRTY DOLLARS will place some homeless child in a carefully selected family home in the country or will enable us at our Farm School to train a homeless street boy for farm life and fit him for an honest living. 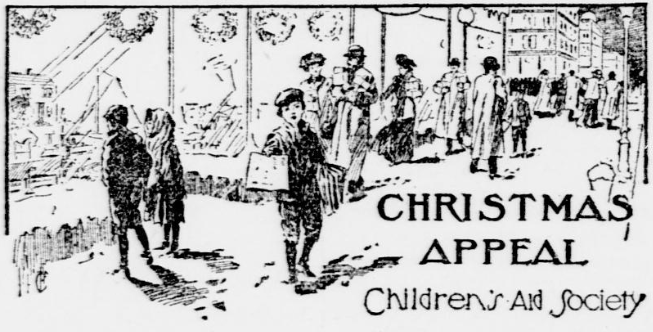 ONE HUNDRED DOLLARS will provide nourishing hot meals or furnish shoes and warm clothing for the poor boys in our Newsboys’ Lodging Houses and Temporary Homes. We as for gifts, large or small, to make a merry Christmas for the children of the poor and to maintain the general work of the Society. Checks may be made payable to A. BARTON HEPBURN, Treasurer, 105 East 22nd St., New York. WM. CHURCH OSBORN, President. C. LORING BRACE, Secretary.